Sri Lanka: Captain, Coach and Manager Suspended for 2 tests and 4 ODIs. David Richardson the ICC chief Executive have charged three of them on 19th June and were found guilty breaching the spirit of the game, breaching level 3, article 2.3.1, which means “ Conduct that is contrary to the spirit of the game” while playing test against West Indies last month. 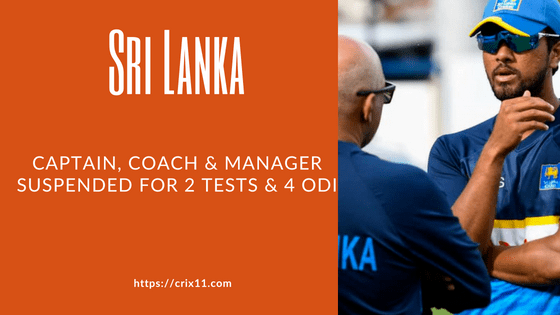 The Sri Lankan Captain Dinesh Chandimal, Coach Chandika Hathurusinghe and Manager Asanka GuruSinha three of them have received eight suspension point. During the last month test against West Indies in St Lucia, the three were pleaded guilty for the conduct which is contrary to the spirit of the game. The Hon Michael Beloff QC, The Independent Judicial Commissioner, today gave eight suspension points to the Sri Lanka Caption Dinesh Chandimal, coach Chandika Hathutusinghe, and manager Asanka GuruSinha. Which on the other means the three of them has been suspended from four ODIs and two Test match against South Africa. On Wednesday 11th of July, a hearing over video conference was held by the chairman of the ICC code of conduct commission. It was a more than 6 hours of the hearing, to determine the sanction and was attended by the legal counsel of both the sides, and received their decision. It was mutually agreed in the hearing that since the minimum sanction of a level was suspension from two test and they will not perform in the upcoming test(12-14 July) and also in Columbo Test which will take place from 20-24 July and these were done against the sanction imposed by The Independent Judicial Commissioner. The Judicial Commissioner’s order also means they will also be suspended from the Dambulla ODIs which will take place from 29th July to 1st August, and also from the Kandy ODIs taking place from 5th to 8th August. As the got eight-point suspension and it means they will be banned from two tests and four ODIs/T20s or eight ODIs/T20s, whichever come first for the player support personnel and the players. Moreover, all of the three Chandimal, Hathurusinghe and Gurusinha has added six more points to their breach for their disciplinary records. Dinesh Chandimal has been sanctioned for the second time since the introduction of the revised code in September 2016, now he has 10 demerit points against his name. But for Hathurusinghe and Gurusinha these are the first offence. Chandimal has four demerit points for breaching Article 2.2.9 in the same test. The three will not face any additional suspension, all the suspension imposed for crossing the demerit points will run concurrently.